My discovery of and personal experience with the use of oral Hydrogen Peroxide to cure and prevent infections and cancers for less than a penny a day. Big Pharma spends billions every year to convince us we need their expensive potions and nostrums to cure ourselves of diseases. Yet Mother Earth has provided us with everything we need to be completely healthy. Hydrogen Peroxide, a simple chemical our own bodies create as part of our own immune response, can be taken orally to prevent or fight off any infection, whether bacterial, fungal, viral, or even cancerous! Below you'll find links to the pages that describe how I learned about this amazing cure-all, my experiences with it, and, finally, the specific protocol to follow when you are ready to be healthy! I begin hydrogen peroxide therapy. So, a few days ago while soaking at the El Dorado Hot Spring outside Phoenix, I was chatting with a gentleman I assumed to be around my age or a little younger, who startled me by mentioning he was 75! (I&apos;m 61.) He was slim but wiry, his skin smooth, and had a full head of light brown hair; so of course I asked what his secret was. Blog Entry posted March 13, 2014, in which my disability status takes an unexpected turn. So, last month, I went before an Administrative Law Judge in my third appeal to get disability benefits to support me since I could no longer work, thanks to my leg, damaged by a bout of necrotizing faciitis, which prevented me from standing or even sitting upright for more than about four hours a day. In unrelated news, a week ago I began an alternative medicine therapy with hydrogen peroxide to try and combat the arthritis that was becoming more and more of a problem. The results from these two, unrelated events, was not at all as expected…but was nothing short of miraculous. Blog Entry posted April 8, 2014, in which I report on the end of my first month of hydrogen peroxide therapy. Today was my 61st birthday. It was also the 30th day of my hydrogen peroxide regimen. An Actual Cure For Cancer! 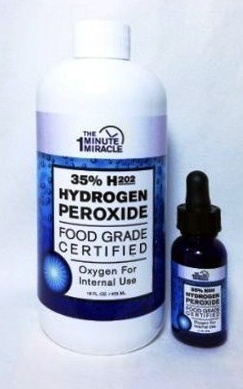 How hydrogen peroxide is a better alternative to chemo. A couple of years ago, my dear friend (and ex-wife), Mary, noticed a persistent pain in her side and asked her doctor to figure out what it was and to fix it. He ran blood tests, sent her for a colonoscopy (which came out clean), and finally asked for a second colonoscopy. This time, the proctologist did find something. The specific protocol for the oral hydrogen peroxide therapy that cures bacterial, fungal, and even some parasitic infections, as well as cancers..
I&apos;ve been chronicling my successes with hydrogen peroxide, and am so often asked for the specific protocol—which I described in bits and pieces—that I decided I would detail it here, for those interested enough in creating improved health for themselves. My minor surgery to remove sea urchin spines from my big toe. As you may have noted, I was in Maui a couple weeks ago for my daughter, Jenny&apos;s, wedding. We were there a week; and of course the rehearsal and actual ceremony took only two of those days. So, on one of the other days, some of us went snorkeling, which is where I wound up on the losing side of a battle with an anonymous sea urchin.